EZdrummer 2 review for finger drummers! 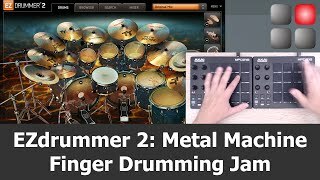 In May 2014, “EZdrummer 2 ” was announced in a wildly different way than any music production software product had ever been. Toontrack didn’t spare any effort in communicating about this product, or in advertising it. 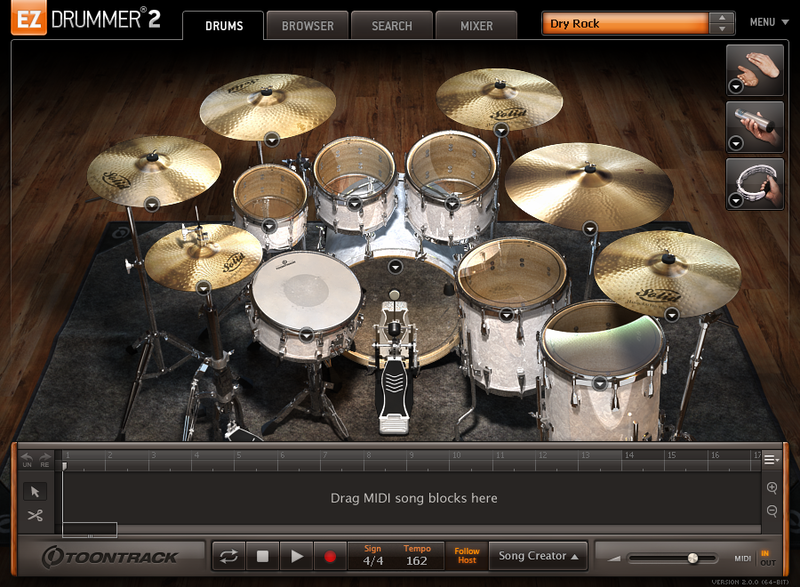 Compared to the legacy version of EZdrummer, a lot of new and handy features were added. Most of these features are geared towards drum programming and easier midi groove browsing. However, there are many more improvements that Toontrack implemented which make EZdrummer 2 a more mature virtual drum module than its predecessor. I should mention that I hardly ever touched the legacy EZdrummer application before EZdrummer 2 was released, as I was happy with the other virtual drum kit options that I had. But, with the release of EZdrummer 2 I thought I’d give the product another try. I am glad that I did. 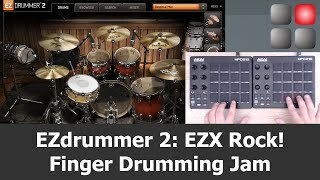 This EZdrummer 2 review is written from the perspective of a finger drummer. This means that a couple of features that EZdrummer 2 offers are not reviewed here as they are only marginally relevant in finger drumming. Those features are the “tap 2 find” functionality, “song creator”, “midi groove browser”, and “play style editing” feature. Why do I skip all these nice features? Well, because all these functionalities are handy for drum programming, but as a finger drummer these things happen in one’s head, so a person doesn’t need software helpers to realize rhythmic ideas and to record drum tracks. As a finger drummer using the XpressPads technique I always try to play grooves rather than program them. Playing EZdrummer 2 like a real instrument is the most intuitive and enjoyable way to create rhythms and grooves, like playing guitar is much more fun and intuitive than programming guitar strumming patterns and melodies in a dedicated guitar software editor. Toontrack have created video tutorial materials on the topics that I skip here, if you are specifically interested in those. So, what am I reviewing here? 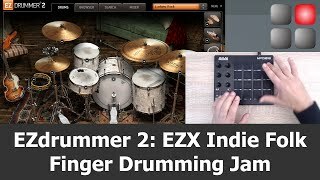 This review is about the usability and playability of EZdrummer 2 and its expansions, geared towards people who want to play EZdrummer 2 and its EZX expansions like a real instrument – by means of finger drumming with pad controllers. That’s why I will only cover features and characteristics that are relevant to finger drumming. While EZdrummer 2’s biggest improvements compared to the legacy EZdrummer application are the new features mentioned above, the application has improved significantly since its first release about a decade ago. The interface of EZdrummer 2 is a little masterpiece. No matter if you choose one of the two drum kits that come with the core application or if you choose one of the EZdrummer EZX expansions, the visuals that Toontrack have created for each and every drum kit of the product line look very appealing. With the release of EZdrummer 2 the graphical user interfaces of the EZdrummer EZX expansions also have been updated by Toontrack, so that they fit perfectly into the look and feel of the updated main application. Moreover, it is great that Toontrack have added so many fantastic visual performance features. This means that the drum kit pieces that are hit are not only lighting up, but the drum skins and cymbals are visually vibrating when hit. 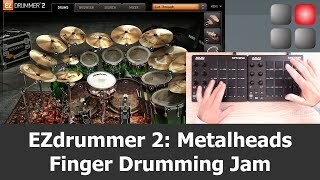 This fortifies the impression that a person is playing real drums and what’s more, it increases the fun when playing finger drumming with EZdrummer 2. Just put on your headphones and you’re beamed into the drum scenery you’re watching on the GUI. Excellent! The EZdrummer EZXs let you expand your arsenal of virtual drum kits. Toontrack offer virtual drum kits for every purpose, be it pop, rock, metal, jazz, blues, folk, country, EDM, latin percussion, industrial, or experimental sounds. By now Toontrack have released more than twenty EZX expansions for EZdrummer 2. All of these EZXs are light-weights in terms of space that they occupy on the hard drive. That, by the way, goes for the main application EZdrummer 2, too. Each EZX takes between roughly 300 mb and 2.5 gb of hard disk space. However, this doesn’t mean that the sound of the EZX expansions suffers much. Sure, there is a difference between EZdrummer 2 and Superior Drummer 2 (Toontrack’s big brother of EZdrummer) in terms of number of samples included, but somehow the sound engineers at Toontrack have managed to get the best sound possible out of EZdrummer 2 and all its expansion packs. I highlight this point because I perceive an improvement in sound quality (especially the quality of the transitions between low-velocity and high-velocity drum hits) when I compare identical EZXs played with the legacy EZdrummer and EZdrummer 2. It almost feels like Toontrack have re-engineered their EZXs with the release of EZdrummer 2. If so, then this was a great idea! For example, if you own the Metalheads EZX you will clearly note an audible difference in the way the kick drum sounds when playing double bass or transitions from very low to very high velocities. Under the legacy EZdrummer, I was a bit disappointed about the quality of the Metalheads EZX. 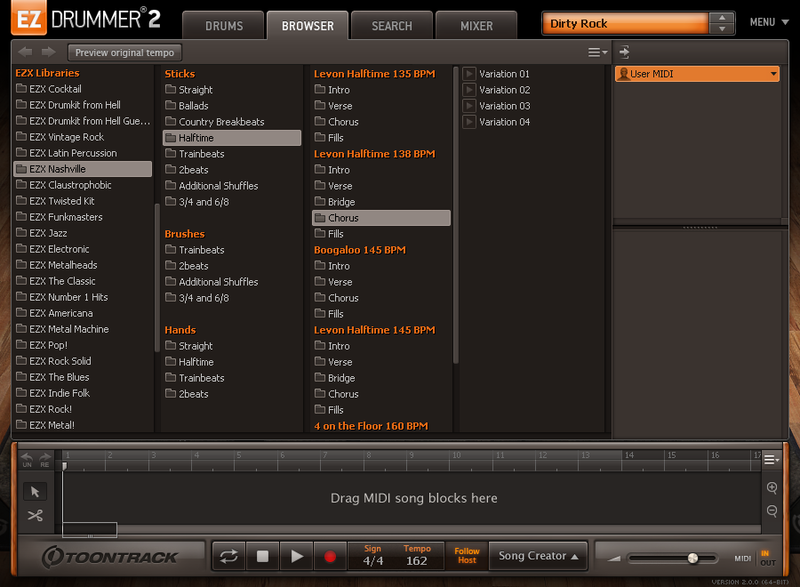 Under EZdrummer 2, I love it! One thing that I like a lot about Toontrack is that they regularly put their products on sale, so when and if you face a tight budget, these sales offer the opportunity to get the EZX expansions at half of normal list price. In stores, EZXs are sold at about US $59, and when on sale, plan to pay about US $29. That’s an awesome price for expansion packs of that quality! A big improvement of EZdrummer 2 is the option to change kit pieces. If you own several EZdrummer EZX expansions, you now have the freedom of assembling a drum kit from different EZXs. That’s great if you have a set of favorite snare and bass drums and want to spice up a factory preset, maybe because you feel that it needs just that little kit piece change to be perfect. 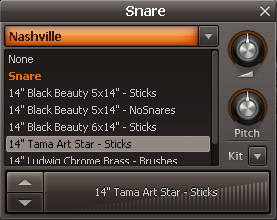 Furthermore, the way Toontrack have designed the kit piece selection window is very effective. Kit pieces can now be pre-listened at different velocity levels before they are loaded into a kit piece slot. On the top drop-down menu in this dialog window, the drum kit (e.g. EZdrummer EZX), from which a specific drum sound shall be loaded, can be selected. Pitch and overall volume of the kit piece can be changed in that same window. In EZdrummer 2 each drum kit comes with its own default midi mapping. Since every drum kit has its own specific size in terms of number of kit pieces and kit piece “articulations”, the General MIDI standard does not offer enough midi notes to cover the full range of articulations for each drum kit anyway. However, Toontrack have tried to get close to the General MIDI standard, which means that the most important kit pieces have been mapped to the correct General MIDI notes. Those are in particular: kick drum, snare drum (open hit / rim shot / side stick) hi-hat (open / closed / pedal) and the ride cymbal (bow / bell). With the toms, other cymbals, and other special kit pieces like percussion instruments, it’s a bit different. There’s actually a 50 / 50 chance that you’ll find the correct tom and cymbal type on the midi note you expect it. As mentioned, this isn’t a disaster, but it makes changing factory presets in EZdrummer 2 a bit less more difficult, especially for finger drummers that like standards and always use the same presets on their pad controllers. Unfortunately, it seems like Toontrack have intentionally skipped the custom MIDI mapping feature in order to differentiate EZdrummer 2 from Superior Drummer 2. So, it might be pointless to hope for such an improvement in the near future. 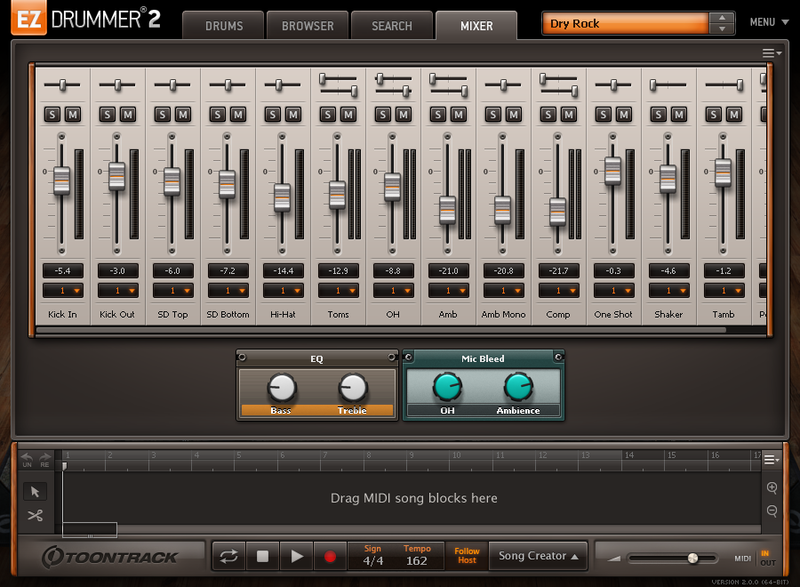 The mixer section of EZdrummer 2 is simple and straight-forward. No bells and whistles here. I like that! I should mention upfront that if sophisticated mixing is needed, there is an option available to rout each mixer track to a different output of the plug-in. This way each channel can be routed to a different mixer track in a DAW (if used as a plug-in). If this is not required, then EZdrummer 2 provides all basic mixing functionalities on one simple view. The standard controls volume, panning, solo, and mute can be tweaked. Furthermore, a short effects chain can be applied, which is, however, limited by the selected preset. This chain and the number of modules cannot be adjusted. Per effect are only one to five parameters available that can be changed. There is one mixer channel for each kit piece plus an ambience channel, a room channel, and one channel per effect. A nice feature of the mixer is the option to switch between drummer’s and audience’s perspective, which inverts the overall panning of the mixer settings and turns around the “spatial” room impression vertically. EZdrummer 2 is worth every cent. My impression of the legacy EZdrummer version has been turned around completely. EZdrummer 2 is a great virtual drum module for finger drumming. It sounds great, it’s easy to handle, loads acceptably quickly, and isn’t hungry for your computer’s CPU. Furthermore, it is expandable and flexible in terms of sound selection. 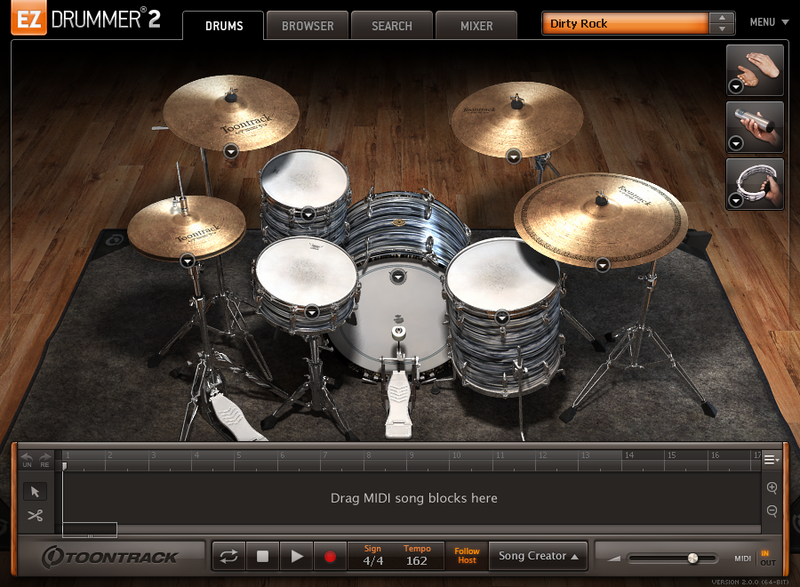 With EZdrummer 2 you get a great virtual drum module at a reasonable price. The only disadvantage I see in EZdrummer 2 compared with many other virtual drum modules that I know of is the missing custom MIDI mapping feature. I truly hope Toontrack will decide to change this one day. If you’d like to offer feedback on this EZdrummer 2 review, use the “comments” section below or the video commenting functions on YouTube or Google+. We’re interested in your thoughts and your experience. 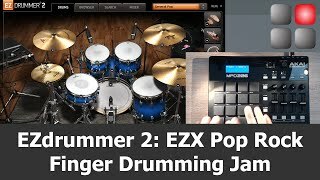 If you found this EZdrummer 2 review and the videos helpful and consider purchasing the product, we’d appreciate it if you’d use the below Amazon link. It does not cost anything additional, but that action helps us keep up the work that we do in order to bring finger drumming to the people. Many thanks in advance!